These badge holders have demonstrated understanding of the concepts related to project schedule management. Through class participation, these individuals have established basic competencies in planning, building, managing, monitoring, controlling, and closing a schedule. These activities include activity sequencing, resource estimation, duration estimation, use of predecessors, constraints, and best practices to create a dynamic schedule. Complete a self-study course in fundamental terminology and concepts relating to Schedule Management. Complete a 7 hour lab session applying the concepts of Schedule Management. 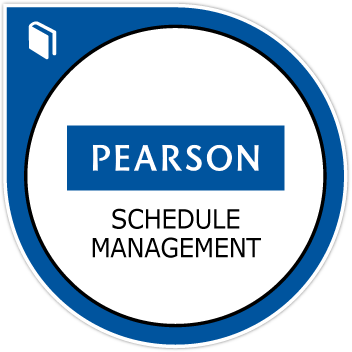 Demonstrate competencies through lab participation and completion of a collaborative student workbook applying Schedule Management concepts to Pearson case studies. Schedule Management course content is aligned to PMI's PMBOKⓇ Guide - Fifth Edition. Course content supports PRINCE2 concepts.